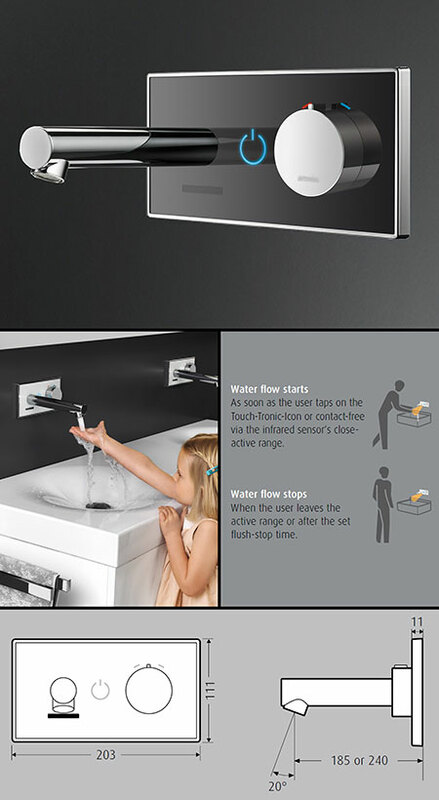 This stylish electronic basin tap is designed for in wall installation. Each digital tap can be manual, semi automatic or fully automatic in operation. The manual only requires the soft touch glass screen to be touched for starting or stopping, the semi automatic is manually started but the tap flow is stopped when the hands are removed from the infrared sensor range and the fully automatic tap function is started and stopped using the infrared sensors. This electronically controlled tap can be supplied with a contemporary black or white glass screen which has a stylish blue illuminated halo light and control icons. This tap is manufactured in Europe ensuring reliable operation and lovely styling. * Black or white glass. * Touch or infrared wave sensors. * Manual, semi or fully automatic. * Illuminated glass control screen.